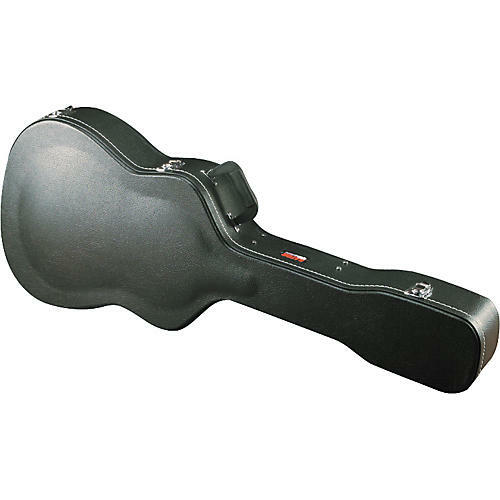 The Gator GWE-Dread-12 Hardshell Archtop Guitar Case protects a dreadnought 12-string guitar from the rigors of the road. Features rugged 5-ply cross-grain plywood construction with Tolex PVC covering, attractive contrast stitching, comfortable matching handle, metal feet on the bottom and side, plush padded interior with accessory compartment, and locking latches for security. Body Lower Bout Width: 16.5"
Body Middle Bout Width: 11.75"
Body Upper Bout Width: 12"
Exterior: 44" x 17.5" x 7"